magic in chicago 2019- SOLD OUT! Sign up with your email address to be on the Magic in Chicago waitlist and to receive updates on future retreats. Come experience the magic of Chicago at the ladies retreat August 23-25, 2019! Chicago is one of the most beautiful cities in the United States and the world. 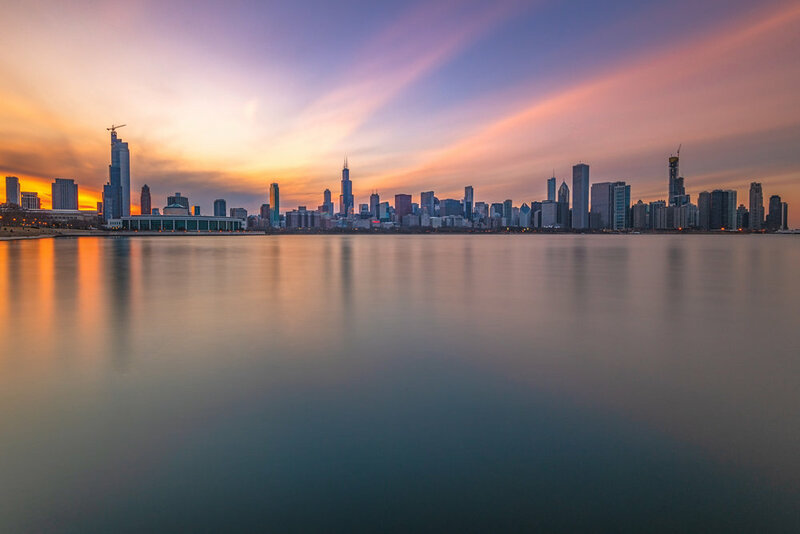 The magnificent skyline, beautiful parks, and stunning views along Lake Michigan provide endless photographic opportunities. The night views are especially incredible and the retreat will emphasize getting out to capture the bright city lights. Chicago has a special place in my heart as I lived in the Lincoln Park neighborhood of the city for 9 years and have lived in the suburbs for 16 more. I ran countless miles along the lakefront path training for 5 marathons, 4 of which were the Chicago Marathon, and I spent 4 years as one of the harpists for the afternoon tea at The Drake Hotel. My husband and I got engaged in the heart of Lincoln Park and all 4 of my babies were born at Northwestern’s hospital downtown. My history in Chicago is rich and extensive. I am extremely excited to bring my ladies retreat to Chicago and share this incredible city with you. 2 days/2 nights of photographic adventures in the heart of Chicago! Dates: August 23rd to August 25th The retreat will begin on Friday afternoon at 3:30 and will finish on Sunday at 12:00. Skill Level: All skill levels welcome. However, a solid understanding of shooting in manual mode and post processing efficiency is encouraged. Activity Level: Very active. Participants should be prepared to do a lot of walking during our weekend together. Our hotel in downtown along Michigan Avenue puts us in close proximity to some great shooting locations in walking distance. For locations out of walking distance, we will Uber to and from these locations, but there may also be walking at each location we visit. While Chicago is quite flat, I would expect us to walk several miles a day. Price: Cost includes 2 days tuition plus 2 nights of lodging, plus post workshop discussion within the Facebook group. Deposit: A deposit of $600 will hold your place in the retreat. The remaining balance is due 60 days prior to the retreat. Possible shooting locations include but are not limited to the skyline from museum campus, the lakefront, Lincoln Park, the Chicago River, streets of the city, and Millenium Park. A more detailed itinerary will be determined as the dates get closer based on the weather forecast. The retreat will place an emphasis on night photography both nights but will also include sunset shoots, possible fireworks shooting on Saturday night, and one sunrise shoot. A post processing discussion will be held on Saturday. Transportation to locations: We will taxi/uber to shooting locations for the greatest flexibility shooting. Cost covered by Kristen Ryan Photography. 5:45 until ~ 10:00/11:00 Head to location for shooting sunset and night photography. 5:15 a.m. Head out for Sunrise (6:09 a.m.) and morning shooting. Alternate sunrise shoot possible or morning photo walk until 9:00 a.m.
Not included in the workshop: Airfare to Chicago, transportation from airport to hotel, parking at the hotel ($56/night at attendee’s expense) snacks and meals outside of those listed as included. Sign up for the retreat newsletter to receive all the updates on the newest retreats and registration info!